Just as I was about to sink down onto the steps where we’d sat the day before watching the toddler playing football and put my head in my hands in despair there was a tap on my shoulder. When I turned around there was Commando. He’d been sitting on one of the green chairs in the sun waiting for me and I hadn’t noticed him when I passed. He was pretty cross but I fell, sobbing into his arms, so relieved to see him. Once he realised how panicked I’d been and that I’d hardly seen any of the park because I was too busy going the wrong way trying to find the cafe he said he’d take me to see some of the things he’d seen while he was running. With his warm clothes on and sipping his chocolate milk we walked together to the gate where we’d entered the park the day before, the Portal Saint Michel. Perhaps if I’d stayed calm and looked at the problem logically I’d have found it back at the beginning and saved us both a lot of trouble. From this perspective everything fell into place and I knew exactly where I was, or as much as I ever do. 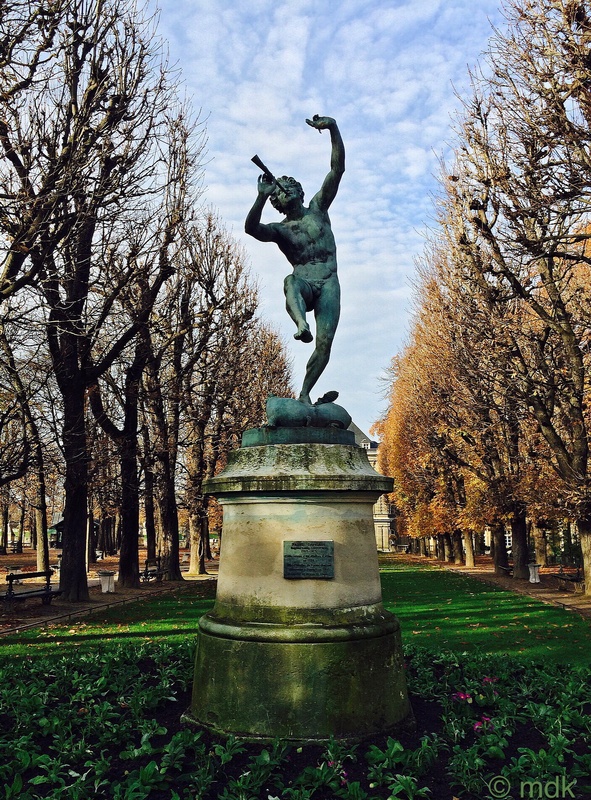 There was the dancing faun bronze by Eugène Louis Lequesne, that had made me smile as we first walked through the gate. Standing on a pedestal beside the path he looked so jolly and full of life and was a lovely welcome to the gardens. Following the path around the perimeter of the park we soon came to a large and imposing fountain with a beautiful frieze, cherubs and lots of moss. A sign above the cherubs told me this was the Medici Fountain, in fact this was slightly misleading as it is actually The Fontaine de Léda, by architect Louis-Simon Bralle and sculptor Achille Valois, moved from the rue Vaugirad in 1858. Still feeling slightly shaken and a little silly after my getting lost debacle I was not quite as enthusiastic as I might have been and took just one photo. “Wait until you see the other side,” Commando said, trying to cheer me up. He had a point. When he led me round to see it I couldn’t help but smile. 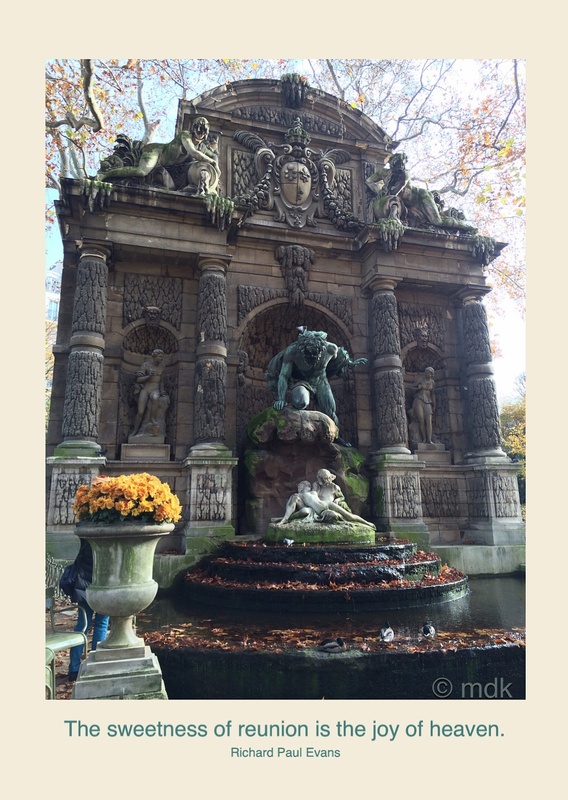 This was the real Medici Fountain was built in 1630 probably designed by Tommaso Francini, although no one seems sure. Originally it stood against the wall of the Orangerie but, after Marie de’ Medici’s death, the palace and gardens fell into disrepair. In 1811 Napoleon arranged for the fountain to be restored by Jean Chalgrin, the architect of the Arc de Triomphe. 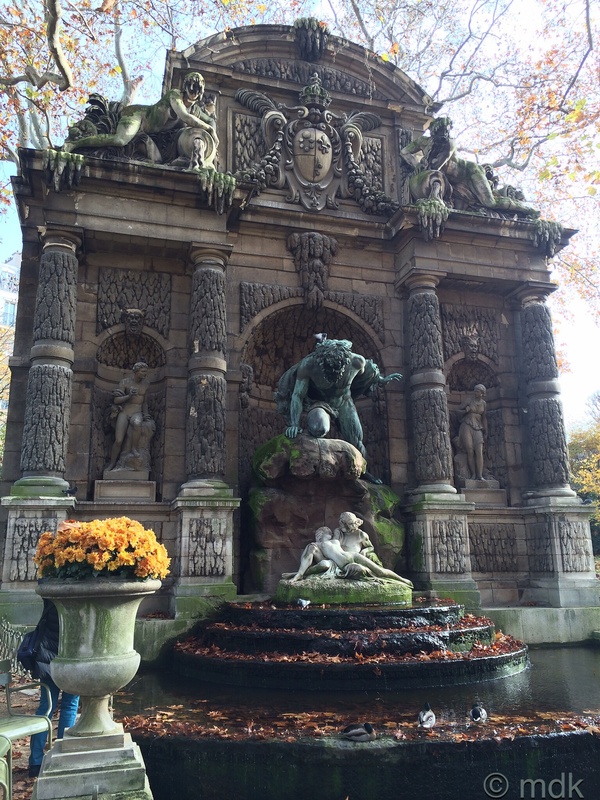 Then, in 1864, the whole fountain was moved to its present spot under the direction of Baron Haussmann. 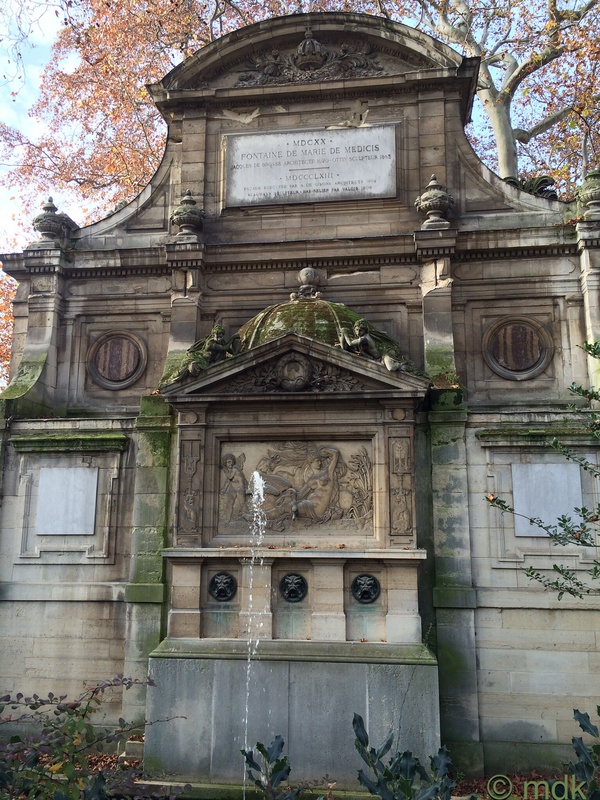 The architect Alphonse de Gisors placed the Fontaine de Léda behind it where the wall of the Orangerie had once been. 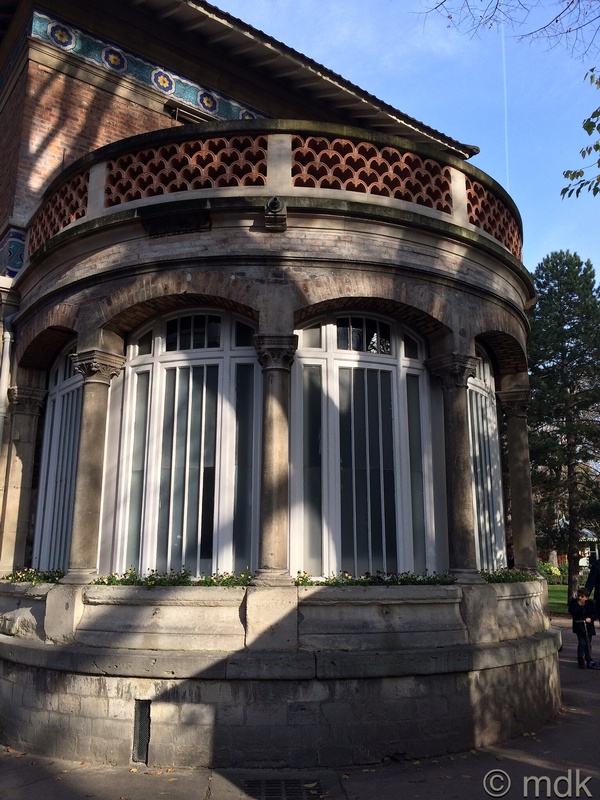 De Gisors completely renovated the old fountain and removed the simple basin, replacing it with a long pool. He also replaced the original statues with a group created by Auguste Ottin, a bronze of the Odyssey’s cyclops Polyphemus and two lovers Acis and Galatea, in white marble. 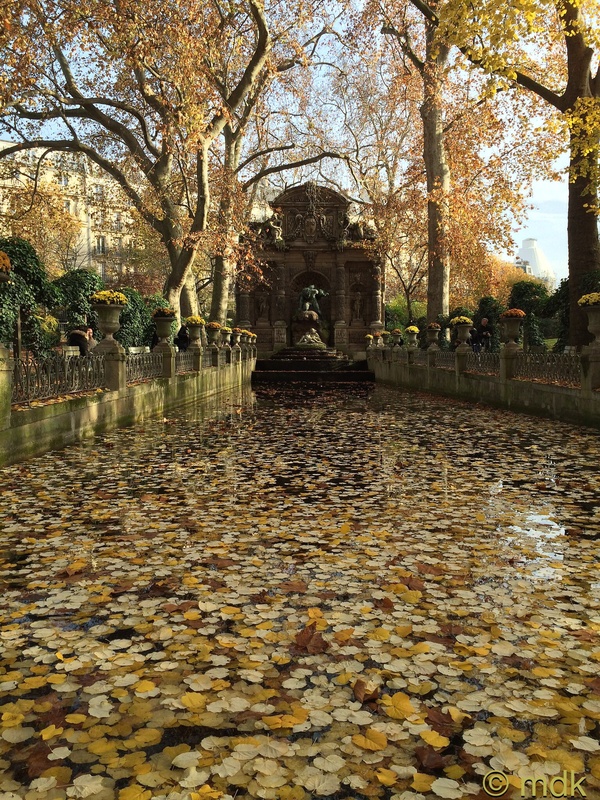 The whole thing, especially with the pool filled with autumn leaves, is quite breathtaking. There were lots of other things I’d have probably stopped to take pictures of if I’d seen them when I was lost but, as I’d already kept Commando waiting for so long, I restrained myself. Obviously I will have to go back to Paris again and wander round to make up for it. There was a stop to look at a little building on the far side of the park. 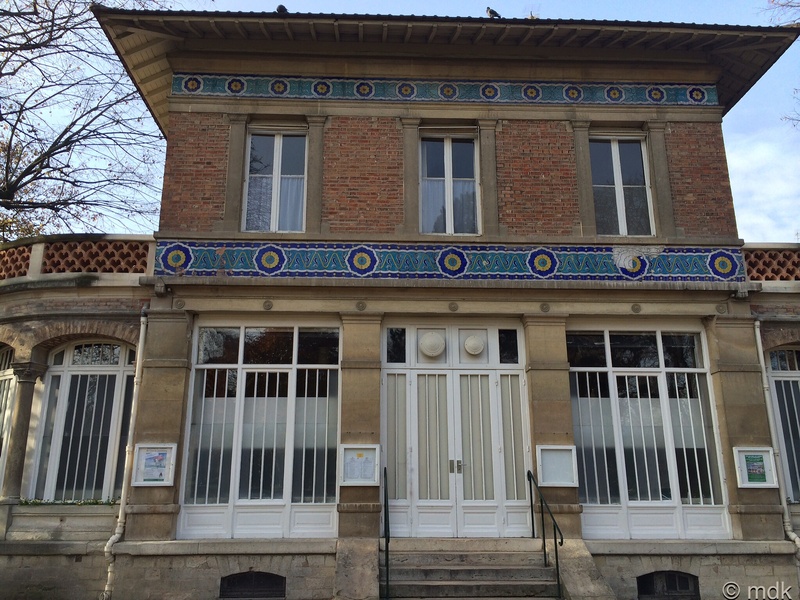 We couldn’t work out what it was but it had a Japanese feel to it, the most beautiful blue tiles in two bands under the eaves and rounded balconies at each end with a balustrade of heart shaped terracotta. Extensive Googling tells me this is used for beekeeping classes and there is an apiary in the park. What a pity I didn’t get to see it because I’m sure Martha over on Theraputic Misadventures would have loved it. 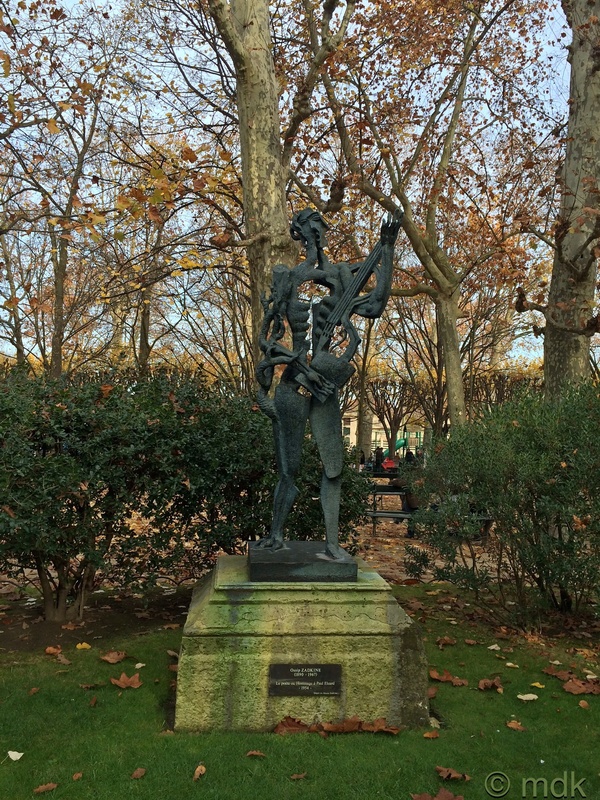 There was one more stop to take a quick photo of a more modern piece of sculpture, Le poète ou Hommage à Paul Eluard, installed in 1954 by sculptor Ossip Zadkine. It might not have been my favourite but it was probably the most unusual sculpture in the gardens, then again, I missed most of them because I was busy getting lost. There is a lesson in there somewhere and maybe one day I will learn it. Commando was in the mood for a takeaway coffee and a walk back to the hotel to loosen his muscles after running so we made for the the Starbucks on Boulevard Saint Michel. 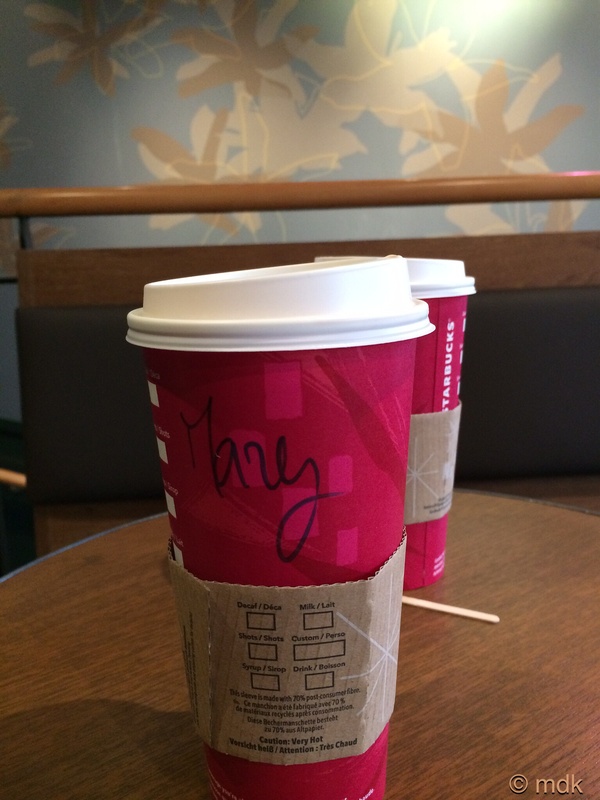 As they had had so much trouble understanding my name to write on my cup the last time we’d been there I made a special effort with my accent. In actual fact I felt quite proud of my attempt to pronounce my own name in the French way. Obviously I was still rubbish because, although they appeared to understand me this time, when my cup arrived it had Mary written on it. Oh well, back to the drawing board. Ah well, all’s well that ends well and you took some good pictures too. So glad all worked out in the end! What lovely shots you took! Thanks for the mention, also. Love your travels. I wish I’d known about the bees while we were there. I’m sure you’d have been interested in the photos. All that dashing about when I could have been poking around the park exploring did seem a waste but it was my own fault for not being my systematic and stopping to really think about it. As for coffee, it is one of my worst weaknesses. That is the most elaborate fountain that I’ve seen in a while. Amazing how in those days they could just buy something like that in a foreign country and ship it home. I think the fountain was actually made in France but quite a lot of things were just bought and shipped. Money was no object to the French aristocracy but then I guess that is why they lost their heads. With a name like the Medici Fountain I thought it had probably come from Italy. Europe is confusing. So glad you found each other. These shots are stunning! GLad you found him! It’s a lovely garden, isn’t it. My husband and I spent a day there a few years ago. Love all the sculptures and the Statue of Liberty. When we were there a brass band from England was playing on the a little bandstand – somewhere near your cafe, I think. The bandstand is just across from the cafe but no one was playing this time. Thank you. It’s almost as if they made it for photographers.